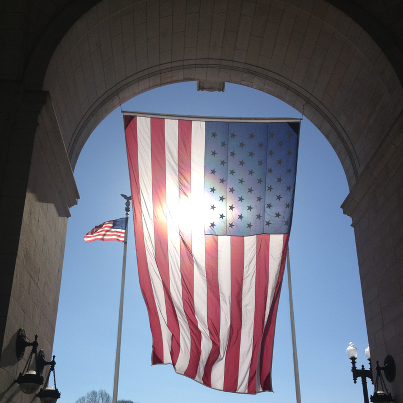 I have so much to write about my trip to Washington, but, as always, I’m fighting the clock. Sleep this morning was more precious than gold and I simply couldn’t give it up – not even for you. But I want to tell you one thing today. The rest can wait, but there’s one thing that can’t. I want to tell you where everything began and where everything ended for me this weekend. And with the right to self-actualization and self-determination. The Inauguration – with its historic inclusion of so many previously disenfranchised human beings – with its recognition of the equality of love and the equality of race and gender and creed and monied and poor – it was about respect. My incredible meeting with Ari Ne’eman, President of the Autistic Self Advocacy Network. A meeting at which I offered myself up as an ally – not to lead but to follow, not to determine but to support, not to divide but to bridge – it was about respect. I left Washington convinced, perhaps for the first time, that what I seek for my daughter, what we seek for ALL of our precious children and the autistic adults who came before them, is possible in my lifetime. IN. OUR. LIFETIME. As I looked through the crowd at so many older African-Americans who had come from the farthest corners of our nation to witness history, I felt it. When I heard the roar of the crowd at the President’s recognition of our gay brothers and sisters, I KNEW it. When I talked to my dad the following day, his voice cracking, reminding me, “Jessie, I was there when they turned hoses on the Freedom Riders. I was there when George Wallace stood at the schoolhouse door and said, “Never.” I was there,” I had hope. There’s so much more to say, but time is tapping me on the shoulder now. So I’ll leave you with two things. One is what I posted on the Diary Facebook page on Monday night, still trying to process it all. It’s amazing what you learn about yourself on days like today. About your own vision of the future and what you want this nation to look like for our children. For me, it’s about dignity. About respect. About recognition of humanity in all of its glorious variety. It’s about the ability of each and every citizen to enjoy the fruit of his or her own labor. For opportunity to be TRULY EQUAL – not only across race, creed, gender, socioeconomic class or whom one may love – but across and inclusive of ALL OF HUMANITY. Listening to the speeches today I was moved to my core by the surety that we are on the brink of understanding and recognizing the civil rights of ALL human beings. That is my vision for this nation’s future. For OUR future. I saw it today. Up over the mountain, I saw it. And I leave our Capitol knowing that it is within reach. We’ve got work to do, my friends, but mark my words — We. Will. Get. There. There is so much more to write about this. But no matter, it will serve as both the beginning and the end of what I have to say – in the smaller sense of this post and in the largest sense of everything that I do here. It will be the beginning, and ultimately, when my girl is ready, it will also be the end. Because this is where it starts – with my girl, and with not just my desire to help her, but with my respect for her and ultimately for her ability to help herself and her community someday soon if she so chooses. It starts and ends with respect. It starts and ends with my girl. It’s so much more than a beginning. I hope I can see it in my lifetime, as well! We’ve come so far! I love this. Maybe there is hope in our lifetimes and certainly in our children’s. Wow what an awesome message for Ari to write. Love it. Glad your trip left you feeling positive. I got chills from this, because I’m finally at the point where I believe we can get there too. Beautiful post! Had to share with you the status I just posted on my FACEBOOK page! This morning I was reading Diary of a Mom’s newest blog post (Link in first comment) and my boy happened to walk in. 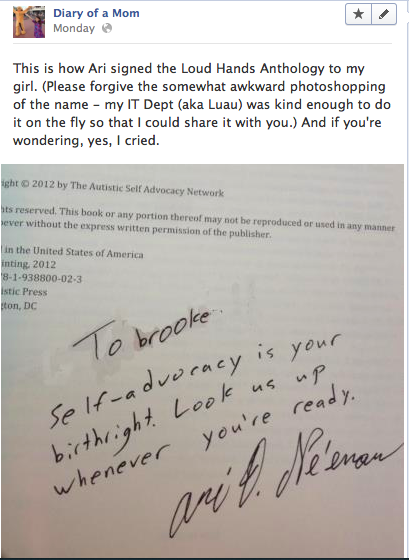 So I showed him the words that Ari Ne’eman, President of the Autistic Self Advocacy Network wrote on the book he signed for Jess’ daughter Brook. It said, “Self Advocacy is a birthright. Look us up when you are ready.” I looked at my boy and I repeated those words to him and added, “Don’t let people talk for you baby!” To which my brilliant boy replied, “I won’t mom. Words are a powerful weapon.That is why it is so important we choose them wisely!” Then he walked away. I know he was repeating a phrase he has heard me say so many times before but still he got it. He knew when to use his words and he spoke and I listened and folks I cannot begin to tell you how wonderful that moment felt. I love Ari’s message to Brooke. I have hope, too. Each generation has its time and its challenges. I for one, am so very glad that it is your time and it is in such capable hands. People like you and the ones you met in Washington will carry the fight even better than we did for you are smarter and better equipted. Hope is what drives us to do !